Before I get into what happened at the party today I can’t help but mention that if we were you on day 10…we would be done!!! If you haven’t signed up for your 10-day-pledge yet, I just want to say that now that the last 10 days are over it did go by fairly fast, and our entire family managed to make it through for the most part. BUT we still have the equivalent of nine 10-day pledges left. So in the most loving way – don’t even start with me and your excuses of why you don’t think you can do it! I took my girls to a birthday party this morning and I am thrilled to say that having them eat separate food went off without a hitch! I was feeling very discouraged yesterday after the donut incident, and the party this morning was just what I needed to feel revived about getting through the rest of our 100 Days of Real Food pledge. I had spoken to the birthday girl’s mom in advance and knew they would be serving pizza, snow cones and cake. Bringing our own food was going to be way more work for me of course, but I still got up this morning and threw together a homemade whole-wheat pizza and whipped up some sugarless cream to put on top of the honey/chocolate/pecan cookies I had experimented with last week (pictured). I also had some organic all natural juice boxes and frozen juice concentrate to use as a substitute for the snow cone syrups. All in all, my girls loved everything they ate and either didn’t notice or mind that their versions were slightly different. 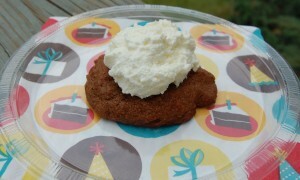 My 5-year-old even said that some of the kids might wonder what her cookie with whipped cream is and wish they had one too. Whew! Last week, I mentioned that my husband would also be facing one of his first big challenges by going on an overnight business trip while having to stick to our rules. I did send him off with a bag of approved snacks (which again is more work for me!). On the first day he was short on time to get to his meeting so he ended up eating quite a few of the snacks with some bottled water as his lunch including; banana, apple, zucchini/cheddar bread, homemade granola bars, dried fruit, and some nuts. For dinner he went to Ruby Tuesday’s and ordered grilled salmon (without the sauce), steamed sugar snap peas, brown rice topped with cheddar cheese & red bell pepper, and a side salad with olive oil. He felt satisfied with this meal, although, I have to wonder how much more variety he will find on future trips. We will see soon enough! For breakfast the next morning he had a banana and some of the other snacks from the bag. At lunchtime he went to a sushi place that ended up not having brown rice available so he ordered grilled shrimp and zucchini (with no sauce) that he supplemented with a tomato and zucchini/cheddar bread from the snack bag. Overall he thought sticking to the rules was not a big deal, but at the same time it was pretty inconvenient. He was annoyed that the sushi place didn’t have brown rice and then when they brought out his food it was covered in a teriyaki sauce (that had sugar in it and who knows what other ingredients) so they had to redo his order. He also said that having the snacks in the car was key. They helped on the first day when he didn’t have very much time to find an approved place/meal for lunch and then again to help supplement his meal when whole grains were not available at the lunch restaurant. I hate that it wasn’t easy, but I am so glad he managed to stick to the rules! Excellent post. I was checking constantly this blog and I’m inspired! Extremely helpful info specially the last section :) I care for such info much. I used to be looking for this particular information for a long time. Thanks and good luck. I love your website. I eat very healthy but I am so discouraged with my kid’s eating habits (boys ages 4 and 6). They are so picky and they will gag or throw up if we have them try something that they are bothered by (texture or smell or appearance). I am trying so many different things like smoothies, chocolate dipped fruit, homeade treats. I just don’t know what to do and certainly feel like my 6 year old’s lunches consist of all snacks (even though they are organic and not terrible, he isn’t get enough fruits and vegetables.) I am in the process of clearing out our cupboards of junk and feel like if we don’t have it in the house, they are going to have to eat something. I am wondering if your girls are naturally not picky or if you have any advice for me. I do have a vitamix which I’ve been using with the hopes that they will eat smoothies but my 6 year old says they don’t taste like the ones at the mall. I am just discouraged. Thank you for your reply. I will just keep trying and remember what you said about it taking a long time. I have heard that kids have taste buds that are more sensitive since they haven’t been “watered down” (if this makes sense)over the years. Maybe that is why it is harder for kids to eat a big variety of foods and textures. I will look at the post you told me about. I just love your website and love getting the updated blogs through my email. I admire you and how you switched over for your family. It takes a lot of strength, especially when we are constantly bombarded with junk food at various events. I am afraid that people will think I am really weird if I go 100% in this direction but I am going to keep trying to get my kids to eat healthy and will try not to get discouraged. I just found your blog & I am loving it! I am also trying to cut out the processed food in my family’s diet. I do struggle with eating occasions outside the home though. I have no problem with preparing alternate meals for my kids to eat at a party but I do struggle with how to talk to other parents about it. I don’t want to appear as if I think their food choices are bad or that I’m judging them or that their food is not good enough for my kids. How did you discuss bringing your own food with the birthday girl’s mom? Question – what did you say when you called the mother? I feel like I would appear rude or elitist or something if I called and explained an “all natural” diet and that I was bringing my own food to a party. My family is not exactly supportive of my new diet “fads” and do not understand how important I feel it is for my health!